A variety of insect pests, as well as mites and snails, attack water garden plants. Many are the same kinds of pests that attack other ornamental, garden, and vegetable plants, pests such as spider mites, aphids, beetles, borers, leaf miners, leaf rollers, whiteflies, leafhoppers, and moth larvae. Other pests, such as caddis fly larvae and water snails, are peculiar to water plants. 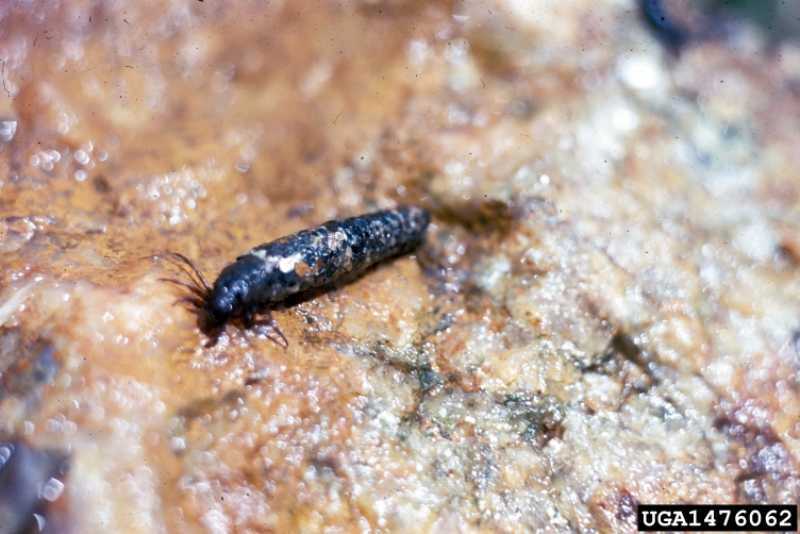 All of these pests, familiar and otherwise, present special treatment challenges when found in or adjacent to water features. Many ponds include fauna as well as flora. Fish, amphibians, and other desirable fauna, including desirable insects, may be harmed or killed by some pesticides normally used for pest control. Some water plants also can be damaged or killed by pesticides commonly used on non water-garden plants. While most ponds and water gardens, once established, can do quite well with minimum pest management intervention, all aquatic, shoreline and marginal water side plants are subject to attack. Newly established ponds and those that have been cleaned and refilled are most vulnerable. Since most pests we deal with are not purely aquatic, a close examination of non-submerged surfaces can reveal the culprits. Various leaf miners tunnel between leaf layers. Some tunnels resemble those of the boxwood leaf miner, others are more characteristically serpentine. False leaf-mining midges and some caterpillars chew trails along the leaf surface or water lilies. These trails eventually rot through the leaf. Leaf rollers roll up entire leaves or cut portions and roll up edges to form homes. Iris sawfly larvae take out chunks of iris leaves, sometimes leaving saw-toothed margins, or sometimes, leaving nothing but a skeletal central vein. Water lily beetles and other beetles and larvae strip the surface layer of leaves and leave circular or elongated holes. Damaged leaves eventually rot. Aphids, spider mites, leaf hoppers, and whiteflies leave their characteristic “footprints” on a variety of above-water growth. Truly aquatic pests include china mark moth larvae, caddis fly larvae, and water snails. Water snails leave irregular holes in leaves and stems and are usually fairly visible on underwater growth. Small, ¼ inch or so jelly masses of snail eggs are often visible on underwater surfaces. Caddis fly adults resemble small moths, and like moths, are attracted to night lights. The larvae, caddis worms, form small portable protective cases out of leaves, sticks, sand, or anything else available. They are difficult to spot underwater. Caddis fly larvae can do considerable damage, eating water lily and other water plant roots, stems, and leaves. China mark caterpillars feed on water lilies and other water plants. Caterpillars have gills and make “homes” by cutting two leaf ovals and joining them together with silk. These caterpillars can cause extensive damage, eating large holes along leaf margins and sometimes burrowing into leaf stems. China mark females lay egg clusters on leaf undersides in later summer. Caddis fly adults generally have one generation yearly. Eggs are usually laid underwater. Water lily beetles, depending on species, have one or two generations yearly. Females chew holes in surface leaves and lay eggs around the underside edges of the hole. Adults over-winter in plant debris at water’s edge. Life cycles of the remaining pests duplicate those of similar ornamental and garden pests. Refer to information on those pests for their life cycle data. 1. Natural controls. Fish relish most of these pests. For those pests with one or more of life stages underwater, fish will constitute the primary control measure. Other predators, insects and amphibians, can also be effective. 2. Mechanical controls. Regular inspection and hand picking of pests is advised. A strong water spray will knock many of the above-water pests into the water, and the fauna can do the rest. Removal and destruction of infected leaves will significantly reduce miner and leaf roller infestations. 3. Biological controls. BT treatments are appropriate for some pests. 4. Plant selections. Should some plants continue to show unacceptable damage levels, consider more pest resistant species and cultivars. 5. Cultural practices. Do not place a night light close to ponds. Lights will attract pest adults and increase pest levels significantly. Thorough fall cleanups and weed elimination will reduce over wintering pests. 6. Pesticides. Few pesticides are safe for fauna in or around your pond. Fish, amphibians, desirable snails and insects, visiting birds, and pets may be harmed by contaminated water. Additionally, insecticides safe for most ornamental, garden, and vegetable plants may not be safe for some water plants. Keep pesticide use to a minimum and insure that printed directions specifically indicate its safety under these circumstances. Strategy 3, consult the Organic Materials Review Institute (OMRI™) for appropriate Bacillus thuringiensis (Bt) products.